I am glad you visit this website. God is definitely getting your attention today! He knows the real you, without the external façade and frills. He knows your struggles and temptations that you face every day. He even knows the mistakes and sins that you have committed. He knows the miseries that these have caused you and loved ones. God wants to give you peace and joy once more. God, who is your Creator, will forgive and cleanse you from all unrighteousness when you confess and surrender all your sins to Jesus Christ. You need to be sorry for your sins and willing to give them up. Then Jesus will say to you just like he did with the adulterous woman in John 8:11 - "Neither do I condemn you! Go now and leave your life of sin". 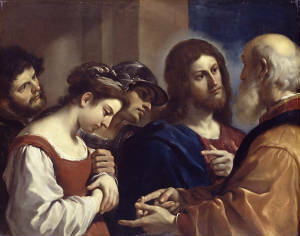 Christ with the Woman Taken in Adultery, by Guercino, 1621 (Dulwich Art Gallery). When you are saved by grace you will want to live for Christ! What Jesus wants you to do is to have a clean break with your sins. A. T. Robertson explains that imperative nature of the instruction,"No longer go on sinning!" Jesus does not tell you to clean up your act before He would forgive you. He has forgiven you and now He gives you the power and strength to break from your sins. He did not save you because you are obedient or good. He saved you by His grace and mercy. You are saved because you have accepted His salvation through faith in Christ alone.